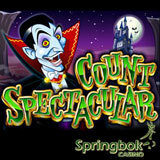 South Africa’s Springbok Casino has chosen its Count Spectacular slot for its Halloween Game of the Month. Get an up to 2500 Rands casino bonus to try it! It’s featured in this month’s $10,000 Freeroll Slot Tournament and you'll earn Double Comp Points when you play it any time in October. To get a 125% up to R2500 casino bonus enter coupon code GOTM-OCT-15 when you deposit. Get 50 free spins on Count Spectacular with coupon code: GOTM-OCT-SPINS (deposit required). This month Springbok's R10000 Freeroll Slots Tournament is being played on Count Spectacular. The highest scoring players by the end of the month will split the 10,000 Rands prize pool. Bonuses, free spins, freeroll slots tournament and double comp points available. Count Spectacular is a vampire-themed slot game from RTG featuring an animated Count as an expanding Wild that can activate the bonus round. In the bonus round, players choose either 12 Free Games with 3X prizes or 4 re-spins holding the triggering Wilds on the outside reels. Five Count symbols hits the game’s progressive jackpot. Count Spectacular has long been one of the most popular games in Springbok’s tap-and-swipe mobile casino for smartphones and tablets which now has 32 mobile casino games. The newest is the underwater fantasy Mermaid Queen. Dedicated to South African online casino players, Springbok Casino offers hundreds of online slots and table games from Realtime Gaming.